Sonic and I have a new toy to play with. Now, lower your eyebrow we've bought something much worse. 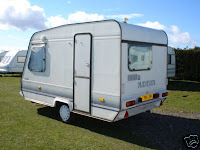 A caravan. So far everyone's initial reactions have been: WTF? You bought what? I'm sure my family will add this to the long list of reasons why they should disown us. We both agree they're the curse of the road and there's nothing worse than been stuck behind one, but it'll be great for WHW runs and hill walking. We picked it up last Sunday and our first gypsy road trip started on Friday. We are truly clueless, so I'm sure it will be a learning experience. On the day we got it, Sonic managed to step inside (when it wasn't connected) and tip the whole thing over. Not to worry at least when he was towing it he said he'd "notice if it came off"? Comforting, eh? To be fair he's a dab-hand. A natural gypsy. Even agreeing to have a towbar fitted to his (pride and joy) car was a big step. Mind you, my little Aygo would struggle to pull a dead cat. Anyway, after a few heated discussions, we agreed to park up at Bridge of Orchy last night. I was running from Beinglas to Kingshouse today. Started at the campsite at 10am. Sonic went on to meet me at Derrydarroch to take all my layers off me. Although it was a dull day, it was boiling. I was practically fainting when I met him. He was laughing at my big red face and my timed tinkering round the coos. Onwards I passed loads of walkers. My third favourite pastime (after running and hillwalking) is scaring trekkers on the WHW. I know I should whistle or at least plod, but it's so much fun. This is day four for most walkers, so it's quite comical to see how many couples have fallen out. I felt really great all the way to Tyndrum. I managed to sneak up on Sonic, who was reading a paper in the car, as he didn't expect me to arrive so early. Quick pip stop to change me socks - which were slipping - and grabbed some more fluids and a Go Sports bar. I tried the bars as pre-London breakfast. Although they're not exactly tasty, they did the trick. I really struggle to eat on runs. And after runs too. Even after London, I couldn't eat until 11pm and even then, I think it was the beer munchies. I ate the bar on the trot. There's a lot of chewing in them, so took me most of the hill out of Tyndrum. Set out on a good pace to Bridge of Orchy - helped with a nice tail wind. I had a Hammer gel at the next stop. Read on the WHW forum that a lot of people swear by them, so I ordered them online. Jeez they taste awful. It was like swallowing flavoured tar. Again, if it does the trick. Dropped my pack with Sonic, who was going to top u p the fluids and give it back to me at Victoria Bridge. I was planning on not stopping at any checkpoints over the weekend. Stomped up the hill and practically flew down the other side. I was amazed to see a huge gathering of cars and people at the other side. When I met up with Sonic he looked less than amused by the crowd. He wished me luck and warned than there was a Mormon gathering and they were taking over the area. And he was right. There were hundreds - and I really mean hundreds - of people coming from Rannoch Moor. All wearing hankies on their heads and pushing jittery prams across the cobbled Drover's Road...all coming in the opposite direction. I don't know if I was more annoyed about them being in the way or the fact that I couldn't walk on the hills, as I had to save face. I suppose it just spoiled the tranquil solitude of the Moors. I kept a really good pace even on the ascent out the moors and again blasted down the otherside to the ski centre. 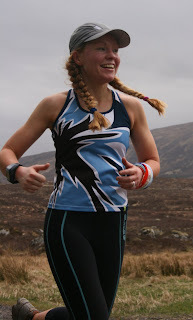 I was very conscious of ensuring there was enough in me for tomorrow's run, but I felt brilliant. I had no low points and really enjoyed every minute. Sometimes I think half the battle is taking advantage of a peaks and talking yourself out of the troughs. Positive chat is a wonderful thing. I finished the whole route in 6:00:31. Was really hoping for under six hours, but hey ho, next time. Last time I did this section (as part of the WHW training run in February) it took 6.05, but I stopped my Garmin at pip and pee stops. Today's time was from start to finish.